The ride doesn't stop for 88 minutes. The Beatles classic film “A Hard Day's Night” was released in theatres 50 years ago on Thursday, and it influenced everything you've ever seen since. I'm only exaggerating slightly. For comparison, one need only look at the most popular Elvis Presley movie of his career, which was also released in the summer of 1964. That particular film is “Viva Las Vegas,” which is mostly looked upon as a period piece. I'm also convinced that “Viva” would not have the appeal it does nowadays if Elvis did not become an artist-in-residence at Las Vegas casinos after he quit doing schlock movies. Nevertheless, it does represent the apex of the Elvis formula. Not only is it in the best location, but it has the prettiest girl (Ann-Margaret), the best race, the best dance sequence (did I mention Ann-Margaret was involved?) and the most memorable song, the title track. But Viva Las Vegas is stuck squarely in the early 60's with its attitude, look, and entire way the film is plotted, scripted, and shot. It doesn't show any signs of the coming hippie revolution, not even to make fun of them in that way nearly all 60's establishment movies did until they realized that the hippies were great consumers of film and television. Nobody cared that Ann got most of the close-ups, especially Elvis. It really took “A Hard Day's Night” to show that it was possible to make films about the young people for the young people in an innovative way that still made a boatload of money. But it all happened by accident. The Beatles were very nearly in an awful, Elvis-type movie that made fun of them instead of celebrating them. United Artists bought the rights to the Beatles first movie without wanting much more than the soundtrack. Although an American, producer Walter Shenson had gotten wind of Beatlemania in Britain and negotiated a highly favorable deal to make the movie with Beatles manager Brian Epstein- Shenson was prepared to give the Beatles up to 25 percent of the profits, unheard of at the time. However, Epstein said to Shenson that “the Beatles would not accept less than 8 percent of the profits,” and Shenson put on his best disappointed face and agreed to the deal. Despite this, Shenson wanted to make a good movie- or at least a decent one. Unlike Elvis or other rock and roll stars who appeared in movies at the time, Shenson let the Beatles have a say in choosing the screenwriter and the director. Naturally, they chose people whose work they liked, and Shenson agreed with their choices- he knew the soundtrack would sell like hotcakes, he'd get his money, and if the film wasn't any good, he didn't really care. (Naturally, after the movie proved to be highly influential and loved by critics, for the rest of his life he continuously gave interviews casting himself as the “magnificent man who put it all together.” I'm not saying he was a bad person, I'm saying he was a businessman looking to make cash. There is a difference, you know.) The writer was Alun Owen, a playwright with a talent for “natural” dialogue, especially Liverpool, where the boys were from. Instead of making up things and forcing the square-peg Beatles in a round-hole of dialogue, Owen travelled with them for a week or so and listened to how they spoke, the witticisms they used, and their general nature. He then incorporated these observations into his script, and at times it feels less like a movie than a documentary. Obstacle shooting, emphasizing the "cage." Of course, that also has much to do with the director, Richard Lester, and his film-making choices. Lester was another American, but he was an ex-pat living in Britain who had gotten a reputation as an innovative comedy director, albeit with short films and television. His most notable work before “AHDN” was “The Running Jumping Standing Still Film” with Peter Sellers. The Beatles has seen and enjoyed that immensely, so Lester's first feature-length film was also their first movie. His first major decision was to shoot the film in black-and-white in order to give it a documentary feel. Despite most scripted films being in color at the time, black-and-white was still the choice of documentary filmmakers because it was much cheaper to get. A documentary crew in Africa following a pride of lions for months would still use black-and-white film in 1964. Lester wanted that feel for this movie, and instead of hindering the film (Shenson was against the decision), it enhances it. Lester's visual choices were so impactful to everything that came after it that MTV gave him an award as the “Father of the Music Video.” (Whenever somebody brings it up, he demands a paternity test.) Lester brought experimental film-making into the general public's eye for the first time in AHDN, and nowadays it's not considered experimental at all- quick cuts (there isn't a shot that lasts more than seven seconds in the first sequence), close-ups where part of the body is cut off, shooting through obstacles to intentionally narrow the viewer's focus, and unusual lighting. Of course, these techniques had been used many times before (famed American director Howard Hawks used obstacle shooting to great effect, and the entire genre of film noir is named because of its lighting), but Lester's efforts were the first time that these features were used so effectively in a “pop” movie, and within a few years his efforts were being ripped off around the world, some done better than others. (The Monkees group and TV show, for example, are blatant rip-offs of this film and the style Lester gave it.) United Artists and Shenson didn't have too big of a problem with Lester's visual choices, because he got the movie done quickly- filming began in March of 1964, and the finished product was released on July 10th. One of the best stories- of both the film-making and the Beatles evolution as a band- concerns the first Beatles song to be considered “acoustic,” Paul McCartney's “And I Love Her.” The Beatles were on an extremely tight schedule in the early months of 1964. The film had been agreed to in late 1963, around the time the Beatles also agreed to go to America and appear on the Ed Sullivan show, an especially critical turning point in their career. And they still had to fulfill their Parlophone record contract at the time. In order for Richard Lester to have a choice over what new songs were in the movie (remember, the entire reason United Artists wanted to do the film in the first place), those songs had to be completed by the time filming began in March. So immediately upon their return from America in mid-February of 1964, the Beatles had to go into the studio and record at least a half-dozen songs for Lester to choose from. Most other bands would toss off a few tracks and not think about innovation. But the Beatles were like no other band. 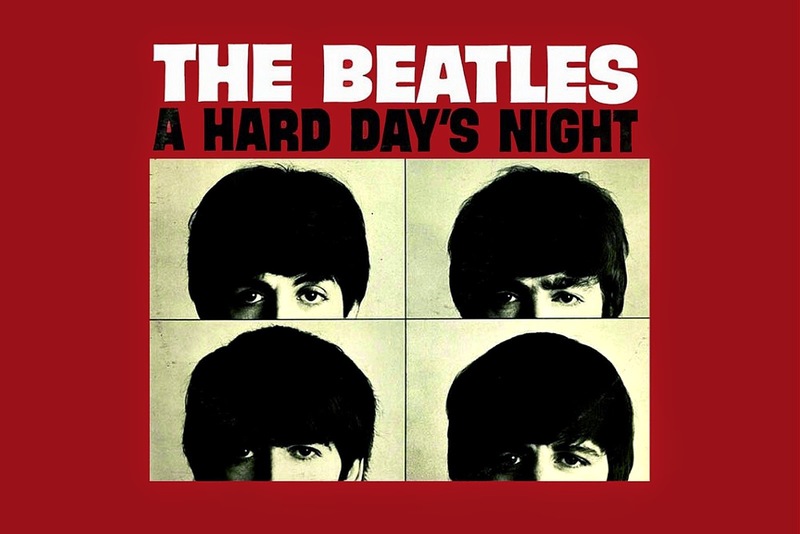 Despite the pressure, Paul wrote “And I Love Her” with the full intention doing it acoustically, but met with resistance from the others, especially their producer, George Martin. As a result, the Beatles did an electric demo of the song, which appears on“Anthology 1.” It is all electric, with heavy drums from Ringo and George picking his electric guitar. It was quickly determined that Paul's original vision of an acoustic song was the right one, and the song was re-made- all within a space of a few days, while recording six other songs, while preparing for the film. When it came to time to choose the songs for the film, Lester must have known “And I Love Her” was a winner. He chose to use it when the Beatles are supposed to be “rehearsing” for their TV performance, meaning he had even more leeway to make it seem spontaneous. He removed the camera from the tripod and had a hand-held shot that lasts almost a minute. The camera revolves around Paul as he's singing, and at one point the spotlight on Paul blasts right into the camera lens, blinding the viewer while showing what it's like from Paul's perspective when he's on stage. Shenson saw the edited sequence and remarked that aside from fixing the mistake with the hand-held camera and the light blast, it looked pretty good. Lester told him that it wasn't a mistake, and they had an exchange of words, with Shenson insisting he re-edit the sequence and Lester telling Shenson what he could do with his suggestions. Lester won the argument, and the shot is used as an example in film textbooks to this day... provided textbooks are still used. George and Patti got serious quick. Lester was also one of the first to really take advantage of having two or more things going on in one shot and making you choose what to look at. In the very first dialogue sequence of the film, a small mirror reflects back the two other characters talking in that shot, so you could look at George and Ringo, or Paul and his Grandfather in the mirror, and see everyone who's speaking without needing a cut. 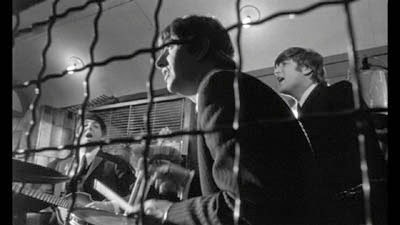 In the “And I Love Her” scene as well as multiple times in the TV studio, the singer will be on one side of the screen, but the camera will also be on two monitors showing what the TV cameras are seeing, and they're seeing two of the other Beatles playing their instruments. Occasionally, Lester simply puts the camera on the multiple monitors, letting you choose who to watch. As you can tell, I am continuously fascinated by this movie and the many stories about it. Here I am 15 hundred words in and I haven't even mentioned that George met his first wife, Patti Boyd, while filming the train sequence- the same Patti Boyd that left George ten years later to marry Eric Clapton, all the while inspiring songs like “Something,” “Layla,” and “Wonderful Tonight.” Boyd clearly made an impression on George as well as Richard Lester, because in all the sequences where “schoolgirl” Patti and her schoolgirl extras appear, Patti is at the center of the action. She has the line “Prisoners?” as she faces the camera in the dining car, she's the one John Lennon drops to his knees in front of when they're going through the train, she's the only one of the girls inside the cage with the lads when they're singing “I Should Have Known Better” (Paul pretends to hit her on the head with his bass guitar), and she's standing at the door as the Beatles dash off the train. 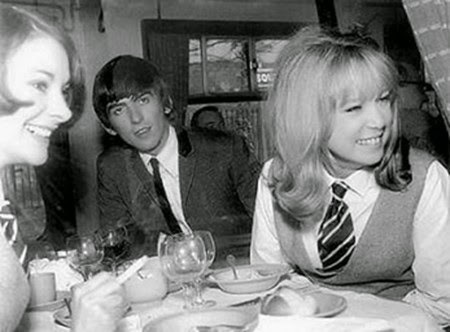 (If you watch George throughout her time on screen, he can't keep his eyes off her.) Yep, Patti got in on the action early. 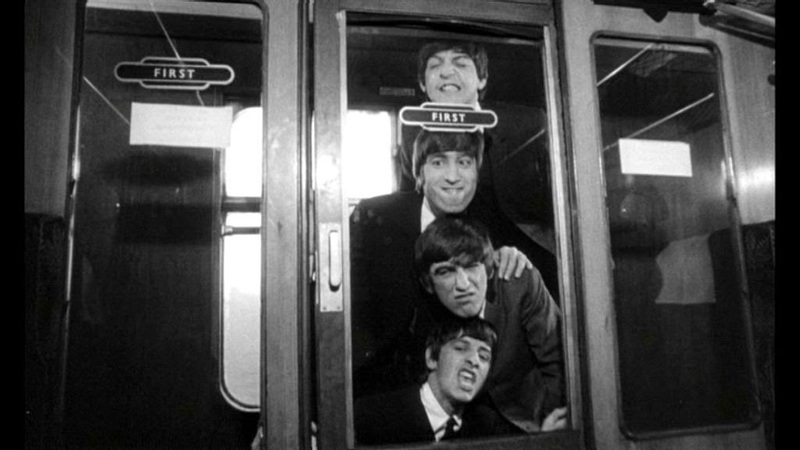 And fortunately for us, because of Walter Shenson, Alun Owen, Richard Lester, and the Beatles, we're all in on the action in “A Hard Day's Night,” and the rise of the Beatles as pop-culture masters continued to grow as 1964 kept on. The ride doesn't stop for 88 minutes? Heck, the ride shows no signs of slowing down. Even the lack of Ann-Margaret doesn't hurt.